When is Veterans Day, and why is it marked on the same day each year? Veterans Day: Why is it on the same day each year? When is Veterans Day? Veterans Day is always observed on November 11, regardless of the day of the week on which it falls. This year, it will be marked on Sunday. Though the Veterans Day National Ceremony, like many ceremonies around the nation, is held on Veterans Day itself, many communities may hold Veterans Day parades or other celebrations on surrounding days. 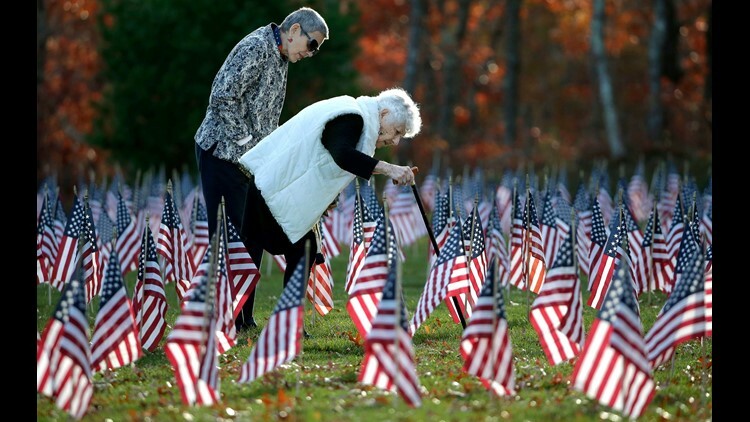 Madeline Fucile, 96, right, is accompanied by Beverly Donheiser while visiting the grave of family friend U.S. Marine Corps World War II veteran Paul Lothrop, in Massachusetts National Cemetery in Bourne, Mass. Fucile and Donheiser visited the cemetery in advance of Veterans Day. When did it become a legal holiday? It took almost a two decades for Armistice Day to become a legal holiday, which occurred in 1938 by an act of Congress. When did Armistice Day become Veterans Day? After World War II, sentiment grew to make the day one of observance of all veterans, and in 1954 President Eisenhower signed a law that changed the name to its current form. Has Veterans Day always been on Nov. 11? No. From 1971 until 1977, following an amendment to the Uniform Monday Holiday Act, Veterans Day was moved to the fourth Monday of October. There was, however, an outcry against the move and in 1975, President Ford signed a bill that returned the observance to November 11, beginning in 1978. What is the difference between Veterans Day and Memorial Day? Memorial Day, according to the U.S. Department of Veterans Affairs, is a day for remembering and honoring military personnel who died in the service of their country, while Veterans Day is set aside to honor all those who served honorably in the military, whether in war or peace. Is Veterans Day celebrated in other countries? Yes, several English-speaking country observe Nov. 11 as a day honoring the military, but it is not usually known by that name. For example, Canada and Australia observe "Remembrance Day" on Nov. 11 while the United Kingdom observes "Remembrance Sunday" on the Sunday nearest to Nov. 11. However, in these countries, Remembrance Day is very much like America's Memorial Day, a day to honor the nation's war dead, as well as honoring all who served in the military. Why does Veterans Day not have an apostrophe? According the VA, the name does not include an apostrophe because it is not a day that "belongs" to veterans; rather, it is a day for honoring veterans. Who decides if a government office or business closes or stays open on Veterans Day? Except for some with critical functions, federal offices are generally closed on Veterans Day. However, when a holiday falls on a non-workday — Saturday or Sunday — offices are closed on the adjacent workday — Monday if the holiday falls on Sunday or Friday if the holiday falls on Saturday. According to the VA, state and local governments, including schools, may determine for themselves whether to close or remain open. Likewise, non-government businesses are free to make their own decisions to close or remain open for business. In general, businesses remain open. In fact, the period around Veterans Day has become a time for sales and offers.